Your much awaited Singapore holiday package from India begins with the arrival at one of the world’s best airports, the Changi Airport where one of the representatives will receive you and escorts you to the pre-booked hotel for your stay. Enjoy rest of the day at leisure activities and exploring the surroundings. Enjoy Dinner and overnight stay at the hotel. After relishing breakfast proceed for the half day city tour of Singapore and visit the much happening Chinatown which is always bustling with excitement, authentic Chinese Food, bright red lanterns and pop stores. After this visit the Little India where you enjoy the true essence of India. It is a thriving and colorful place where you worship at Sri Veeramakaliamman Temple or relish Indian food or purchase authentic Indian Saris. Then visit the Merlion Park which is a landmark and among the major attractions of Singapore. The evening is free for leisure and shopping. Return back to the hotel for dinner and overnight stay. In the morning after breakfast proceed towards Jurong Bird Park. Spreading across 2.20 hectares it is one of the largest parks in the world which is a haven for more than 5,000 birds across 400 species. Here visitors can enjoy the colorful avian world through interactive feeding sessions, bird shows, and exhibitions. The key attractions of the park include the bird discovery center, African waterfall Aviary, Lory Loft Aviary, South East Asian Birds Aviary and Penguin Coast. After enjoying the whole day in natural surroundings return back to the hotel for dinner and overnight stay. Post breakfast check-out from the hotel and proceed towards Sentosa Island which is decked with hotels, restaurants, casino and theme parks in short something for everyone. On your full day excursion to Sentosa visit the Marine Life Park, Dolphin Island a water park and an aquarium. Other attractions include the Butterfly Park and the Insect Kingdom etc. Check into the pre-booked resort for dinner and overnight stay. After breakfast proceed towards Southeast Asia’s first ever Hollywood movie theme park which features an enticing selection of attractions, rides, entertainment for families and adventure enthusiast. It has seven movie-themed zones and each is uniquely designed. After an exhilarating experience step into the many themed restaurants across the park and make sure you have your camera ready for celebrity sightings. Return back to the resort for dinner and overnight stay. On the last day of your Singapore travel package check out from the hotel and proceed towards the airport to board a flight to your hometown or next destination with lots of happy memories that you love to cherish throughout your life. Singapore is a beautiful tiny and one among the Southeast Asia’s most modern city which is a blend of unique cultures, traditions and luxuries. On a visit to this magnificent city, you will find many slices of its multicultural essence, colonial and wartime past, flourishing and luxurious properties, delectable cuisines and great shopping opportunities. So just don’t wait! Book your Singapore holiday package now and enjoy a visit to one of the economic giants of Southeast Asia. 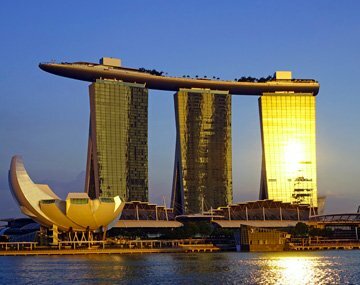 BookOtrip offers you an amazing deals on Singapore Packages from India and ensures a hassle free journey for you. So grab this opportunity now and enjoy one of the most cherished family trips to one of the desired destinations in the world that surely leave you spell bound. Rates are not valid during National Holidays/Festivals/Events etc. Trip was simply "WOW" to Singapore . All arrangements for my Trip made by Bookotrip was good and it was a Hastle free journey !! !